Click the button below to add the Private Accessible 4 hour St. Maarten Shore Excursion to your wish list. The Private Accessible 4 hour St. Maarten Shore Excursion allows you to see and visit the beautiful island of St. Maarten in a short amount of time. You will get a chance to enjoy beautiful scenic views, learn about the history and culture of the island and take some of the most amazing pictures of your entire cruise vacation! This accessible driving tour is sure to be a memory you will cherish for a long time! Among other things, you will get to see some of the most beautiful views in the Caribbean from the hilly St. Maarten altitudes. Views of crystal blue water, beautiful white sand and luscious green nature is a perfect setting for once in a lifetime photo opportunities for you and your family. 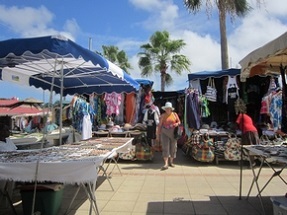 Start this accessible St. Maarten shore excursion tour by meeting your friendly guide, driver and accessible van at the cruise dock and head out on a beautiful scenic drive, visiting both capital cities of St. Maarten, Marigot (French) and Philipsburg (Dutch). In both cities, you'll have a chance to get out of the van and get a firsthand experience of the island. The areas you'll visit are peppered with small local shops, vendors and charming island inspired buildings!Your guide will accompany you on the entire tour, sharing interesting historical facts and island stories with you. Both of the towns are mostly flat and have good disabled access. 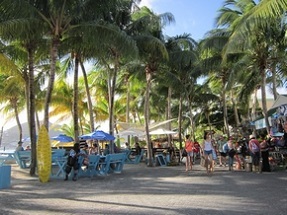 Take time to soak in the tropical atmosphere of the island. 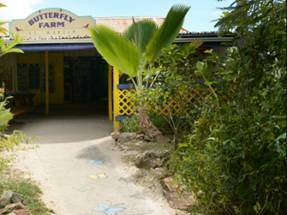 The next stop on your tour will be a visit to a local Butterfly Farm. Get ready for a visual treat as the beautiful, multicolored butterflies surround you! If you wear bright colored clothes or citrus scents, they may even come sit on you! 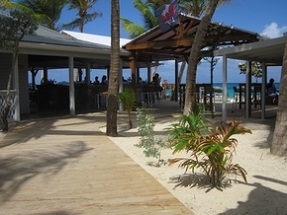 Your day in St. Maarten will end with a stop at an accessible beach lounge right by the water. Here you’ll have the chance to sit down, relax and enjoy a cold refreshment and snack. Your accessible shore excursion of St. Maarten concludes with your friendly guide escorting you back to the cruise dock where your next adventure awaits! 4 hour tour of the island. Enjoy the sea breeze at an accessible beach lounge. 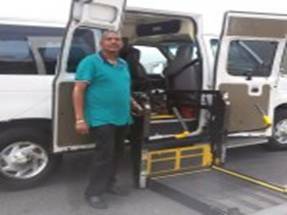 This accessible St. Maarten shore excursion uses a wheelchair accessible minibus with lift. The walking parts of this tour are step-free and mostly flat with paved surfaces. Accessibility Information: The Private Accessible 4 hour St. Maartin Shore Excursion is a driving tour that begins and ends at a meeting point near the St. Maarten cruise dock. This accessible shore excursion involves very limited walking/rolling and is suitable for most disabled travelers. 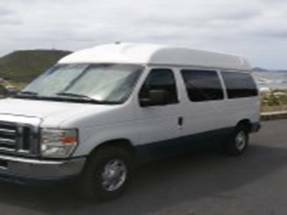 The van is wheelchair accessible and the routes are wheelchair friendly and step-free, whenever possible. Cancellation Policy: 80% refund with 10 days notice. No refund with less than 10 days notice. It is your responsibility to communicate with your cruise line to understand any restrictions on disabled passengers using cruise tenders. Duration: Tour duration is approximate and varies depending on local circumstances. Tours run rain or shine.